Just some pictures from book club at our house tonight. Here are the "kids". Richie, Colton, Haley, Maddie and Lucie. We were missing book club kiddies Ainsley and Sam though. 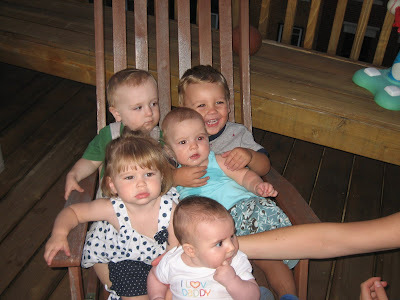 Here is a picture of the "big" kids. "Yeah, Maddie is sitting in my lap!" 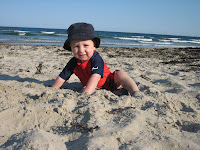 In continuing with our crazy travel summer......we went to the beach in Wells, Maine this weekend. Our friends Joanna and Kevin bought this beautiful house right on the ocean that they let us use. It is an absolutely amazing house and boy did we have fun! Our friends the Revette's were able to come for a bit too. I mean eating overlooking the ocean...does it get any better? And we finished off this great weekend with picking a freezer full of blueberries. 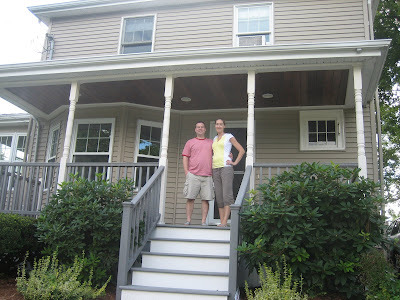 We stopped by Stoneham the other day to see our friends Judy and Matt's new house. It is a beautiful house and the best part is the awesome swing set! Can't wait for their baby!! And while we were there we were put to work. 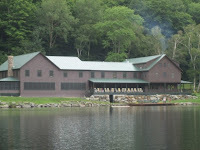 We took our annual Wells/Haight family reunion to the Lake Mansfield Trout Club again. 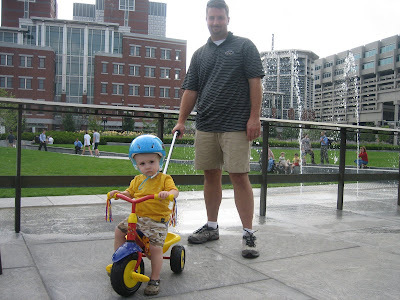 Who knew how much fun a 1 1/2 year old could have? I thought he would appreciate it more next year, but no. HE HAD A BLAST! We went hiking, fishing, swimming, biking, etc...but the most fun was had just throwing rocks into the lake! Just a few pics to show off some of our activities. Doing a little fly fishing. Literally throwing rocks all day long with whatever sucker he could recruit. Even the little ones splashing around in the icey cold water. And sadly ringing the bell to say goodbye when it was time to leave. We had another play date today with Lucie Revette (and her parents!). We went to lunch and dinner with them and watched some of the Olympic opening ceremonies. 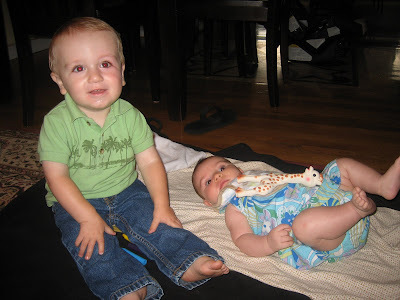 The kids are getting so big already....Lucie has the cutest thunder thighs and Rich can almost say Olympics. Just a quick pic to show off Richie and his wheels!